Let’s admit it: Palm Sunday is a problem. I know I shouldn’t be questioning a moment in the church calendar that goes all the way back to the third or fourth century, but why do I always vaguely dread this day? Here’s how it usually goes down. You arrive at church, and a smiling usher hands you a little palm branch. Your fellow parishioners, likewise armed with palm branches, line up as best they can, the adorable little children in floral dresses (girls) and tiny sweater vests (boys). Adults of various ages are doing their best to look cheerful, when actually everyone is feeling awkward. The music revs up—something processionalish—and a little parade begins. “Hosanna to the King of Kings!” we’re all supposed to say, or sing, or otherwise convey. At this point, we congregants are essentially playing the role of the crowd in the Triumphal Entry narrative from the gospels. We’re supposed to be feeling joyful, because Jesus is the King of Kings, and here he comes in triumph, the humble king whom prophets foretold as Savior. Except that this is the beginning of Holy Week, and Jesus is coming into Jerusalem to die. Unlike the crowds in the story, I know exactly what’s coming, and I do not want to wave a little palm branch about it. Later in the service, if things go as usual in my experience, we will once again be compelled to play the role of the clueless crowd against our will. Someone, typically the preacher, will scold us for turning on Jesus just a few days later and shouting “Crucify him! Crucify him!” How fickle you are! How quickly you turn away from the Jesus you praised just moments before! But wait a minute: I didn’t sign on for this crowd role in the first place, and now I’m getting scolded? This is not meant as a criticism of worship planners. In fact, I sympathize with the challenges of planning a Palm Sunday service. So much paradox. Sure, we can sing: “Ride on, ride on in majesty/ In lowly pomp ride on to die.” But apart from that, how do you deal with the weird contradictions of significance and feeling that characterize this event in the narrative of Jesus’ life? The rest of Holy Week is much easier. On Maundy Thursday we remember the Last Supper and Gethsemane, and we enter into grief. On Good Friday we meditate on the crucifixion and feel sorrow. On Easter we celebrate the Resurrection and feel joy. Easter Vigil, for those who observe it, is a helpful bridge, emotionally and dramatically, from the former to the latter. 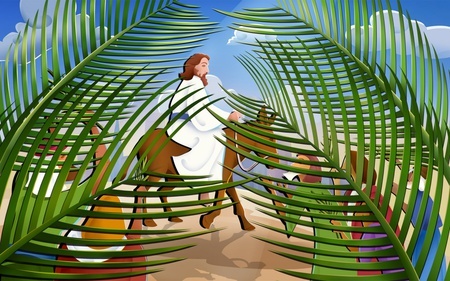 But on Palm Sunday we’re faced with a triumphal entry that is not actually triumphal and a cast of characters who feel all the wrong things. So how are we supposed to feel? Ironic? How do you create a worship service around that? This whole challenge is made worse by the trend toward observing “Passion Sunday,” in which we attempt to cram not only the Triumphal Entry but also the entire Passion narrative into one fast-paced Sunday service. Jog-trot through it all, take a deep breath, wait a week, and show up again on Easter. I understand why churches do this: it’s because so few people attend the Thursday, Friday, and Saturday specialty services. I get it: people are busy. It’s tough to spend virtually an entire weekend at church. And I really do understand worship planners’ compromise solution: better to do a little Passion stuff the Sunday before than to have people skipping over it completely and leaping right from palm parades to flowers, bunnies, chocolate and Easter joy. This is not an ideal solution, however, because at the root of this problem is the inherently dramatic nature of liturgy. Liturgy enables us to re-narrate our lives, to shape our own little stories so that they take on the contours of the great narrative of Redemption. Holy Week is the heart of that drama, and we need time to walk through each of its stages. We should accompany the disciples at the Last Supper, and toward Gethsemane, and at the foot of the cross, and at the empty tomb. But we can’t do it all in one hour! These are hard emotional places to go, and we need time to enter into each of these moments, feel what we ought to feel, speak what we ought to say. This is why the church in its wisdom has spread the dramatic arc of Holy Week over several services over several days. From this perspective of liturgical drama, we might now be able to discern the essential problem with Palm Sunday. For this first act in the Holy Week drama, we are asked to make what turns out to be a false start. The crowd and the disciples were feeling triumphant for all the wrong reasons. I realize this can be turned toward one of two useful lessons: either we are reminded of all the ways we have wrong expectations about Jesus, or we are reminded that this is indeed the beginning of Jesus’ triumph through sacrificial love. Fine, but those are matters of understanding rather than feeling, so that the drama of the service itself feels manipulative and untrue. We’re asked to play roles we can’t really inhabit and feel things we know we shouldn’t feel. What’s the solution? I don’t know. The one Palm Sunday service I recall actually enjoying and appreciating, at St. James Picadilly in London, involved a live donkey. Never underestimate the power of livestock combined with the Book of Common Prayer. Short of that, though, I think Greg Scheer, the Minister of Worship at my church, has a decent solution cooked up for this Sunday. He was given the task of planning a Palm Sunday/Passion Sunday service that involved a reading of Matthew 26-27:25 rather than a sermon. So he took all the episodes of the Jerusalem sequence and used them to give resonance to our usual liturgical structure. The greeting, for example, briefly explains the triumphal entry to give context to our little palm procession. The confession evokes the cleansing of the temple, and the assurance comes through Jesus’ remarks about wishing to gather Jerusalem as a hen gathers her chicks. The anointing at Bethany sets up the offering, and of course an evocation of the Lord’s Supper leads us into the communion sequence. What I like about this is the way it reorganizes all the dramatic moments of the passion sequence, subsuming them into the liturgical drama of our usual Lord’s Day service of Word and Sacrament. This is a Sunday service, after all, which in the Reformed tradition, even in Lent, is a Resurrection celebration, an eighth day, a retelling of the covenant story from creation to the consummation. Later in the week, we will enter into particular moments along the Holy Week dramatic arc. But on Sunday, we have a larger perspective. We do not have to be stuck in the role of the clueless crowd for a whole service; instead, we can stare down the week to come as the redeemed people of God. So I like Greg’s solution in theory. We’ll see how it turns out in practice this Sunday. If it doesn’t work, I’ll propose that next year we’ll have to try a live donkey.